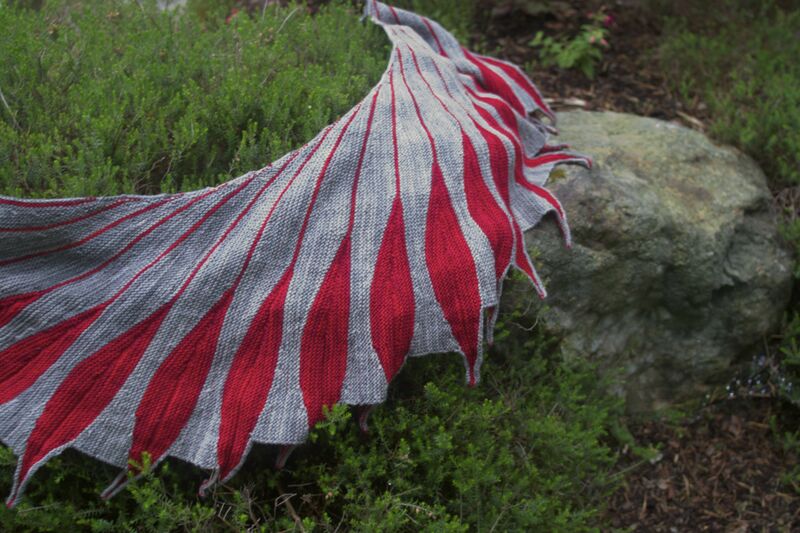 It seems that knitting is so often inspired by Mother Nature, be it leaves, or flowers, and even birds. Which being someone that likes to feed the birds and plant flowers.. this appeals to me. And so when I saw the Dreambird pattern, I knew just the person I wanted to make it for, and just the colors I wanted to make it in. The pattern design is a bit bold, just like the impossible to miss Northern Cardinal. 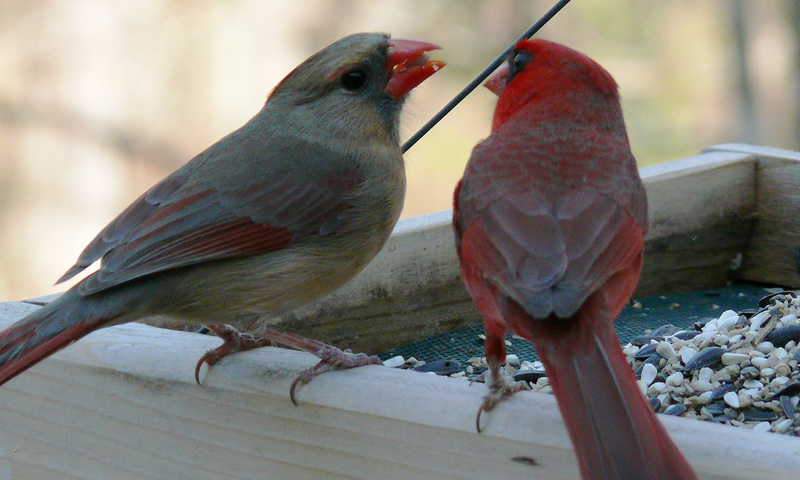 Female Cardinals are one of the few singing Lady Songbirds. However, I felt this would be a good chance to continue in my “Lady Birds” shawls I started with my Gamayun Evening Grosbeak Shawl. I did need to bit of looking to find the right yarn colorations as I wanted some tonal changes, like the change in feathers. Truthfully, we don’t get Northern Cardinals in Washington State, but they are very memorable as one of the birds I first learned about when I started birdwatching. My “bird” perched on the heather and rockwork in my front yard. This pattern is rather different, its shaped entirely with the use of short rows and was a great lesson in the German Short Row technique. It does use binding off and casting on at various places, so that the overall point of view is the wing of a bird, pinyons outstretched as it takes to flight. Since its mostly garter stitch, this is actually a pattern that difficulty-wise would be fine for a beginner; however, there is one caveat to that opinion. The author of the pattern probably gives too much information in the full directions. The intent is that you get the idea behind the design concept as you knit along. The full directions are certainly worth reading, to get the technique if its new to you, and to pick up the pro-tips like how many stitches to carry your yarn along the backside when you change, but after the first feather or two, there is a simpler single page row by row count directions you will probably use most of the time. 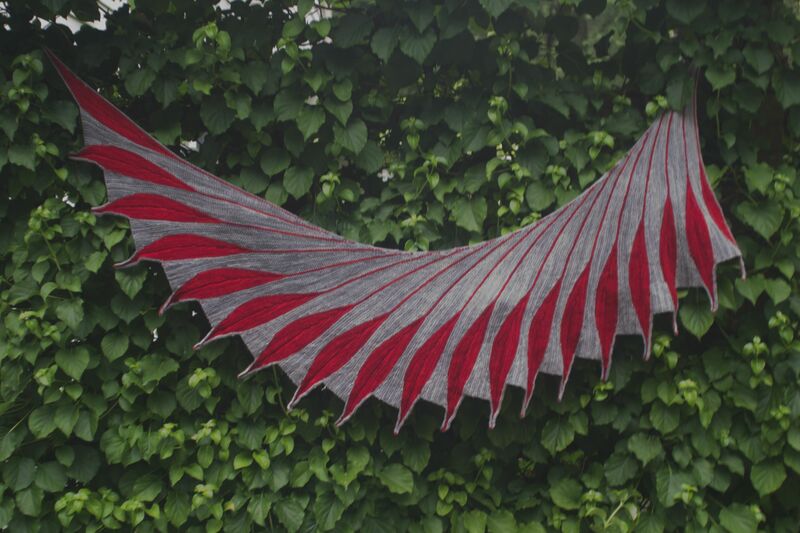 Climbing Hydrangeas – the bird perch-able shawl model.